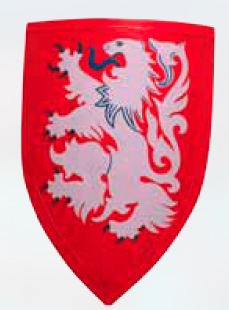 This Red and White Leonine Heater Shield is of a type that developed from the medieval kite shield in the 13th century. This shield is made entirely from fine woods. A classic heater shield design, it possesses a flat top with partially straight sides, with a gentle curve near the bottom that draws the base of the shield into a point. The term leonine means lion, and is a direct reference to the shields heraldic display. The shield's field, also known as the background, is bright red on which is emblazoned a white rampant lion with subtle blue details (such as its claws and teeth). In classic heraldry, the rampant lion is the attacking lion, with its jaws open wide and three claws held out. This page was last modified on 13 May 2014, at 17:28.